How to make the most of your Virus Hunter Island experience! Now that Virus Hunter Island is available, we thought it would be helpful to point out some of the ways you can have the very best experience possible. Here's how to use some of the new features, and a note about how to fix a problem that some players are having. First, most everything you need to know is in the new menu. That's the icon in the upper-righthand part of your screen. 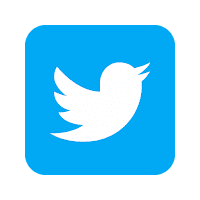 Open it, and you'll see several new icons. The ones on the right side of the screen are the ones you should already be familiar with. From here you can access your Friends page, warp to the travel map, use the Costumizer (coming soon! ), and open your game inventory. That last one's important -- this is where you'll find all of the items you've picked up on Virus Hunter Island. The icons on the left side of the screen are new. The cog icon will open up your game settings, which looks like this. Settings allow you to adjust the volume levels for music and sound FX separately, however you prefer. You can also change the speed of dialogue bubbles. If you want more time to read what the characters are saying, move the slider to the left. If you want the bubbles to go away sooner, move the slider to the right. These changes save automatically, so just press the red X to get back to your game. To start your adventure over, press the "Restart Island" button. Of course, sometimes you want to play in blissful silence. To mute the game entirely, click on the speaker icon. To return to your game from the menu, just click anywhere on the screen that isn't a menu option. If you're having trouble getting new scenes to load, try using a different web browser! This should solve the problem for most people. All of your game data will still be saved when you log in with a different browser. We hope this helps you enjoy Virus Hunter Island even more! It's a long weekend, and that means you've got more time to play and enjoy Virus Hunter Island. Don't miss out on a couple of cool extras. The all-new Hazmat Suit is upgraded to defend against new contaminants, and it's available FREE to anyone who visits Virus Hunter Island during Early Access -- Member and non-Member alike! Just visit Poptropica and hit up the vending machine on Virus Hunter Main Street to claim your free Hazmat Suit. Don't forget to keep up with the Virus Hunter World Champions live map, either! We're tracking everyone who finishes Virus Hunter Island around the world. You can see who's finished in each country, and look up your own rank. You can also see every country where somebody has started playing Virus Hunter Island. Looks like those viruses are taking over! Just as we planned it. Early Access to Virus Hunter Island is now available! Do not adjust your screen. Do not rub your eyes in disbelief. Do not exclaim "WHAAA?!?!" Early Access to Virus Hunter Island is NOW AVAILABLE to Poptropica Members! If you're a Member, you can enjoy everything that our newest, biggest, and best adventure has to offer. If you're not yet a Member, you can play a limited demo of Virus Hunter Island -- or become a Member today in order to play the full quest! Either way, check out the Virus Hunter live map to see who's playing Virus Hunter Island, and see where you rank among the top finishers! We are thrilled to bring Virus Hunter Island to you. Visit Poptropica now to play Virus Hunter Island! New and improved 24 Carrot Island is now available to everyone! At last, the rigorous testing by our most dedicated Poptropicans is complete. We're happy to say that the new and improved 24 Carrot Island is now available for everyone to play! For some of you, that means it's your first chance to try out a classic Poptropica adventure with a bigger screen, music and sound effects, and a lot of other upgrades. We'll still be keeping an eye out to make sure nothing blows up, of course. To play the new 24 Carrot Island, just visit the Poptropica map and enter the Island as you normally would. You'll notice that the improved version shows up on the map in color. As more Islands get the deluxe treatment, they'll show up in color on the map as well. Visit Poptropica now to play the new and improved 24 Carrot Island. Enjoy! When can you play Virus Hunter Island? We know it's been a long time coming. We know you've been patient. We know we've promised a lot. And we've been working around the clock to make sure we can deliver on those promises. Now, we're very happy to say that Early Access to Virus Hunter Island will be available this week! It's the biggest, wildest Poptropica adventure we've ever made. It's got a bigger screen, music and sound effects, and an epic storyline. We're very proud of Virus Hunter Island, and we can't wait until you can play it. We'll let you know exactly when Virus Hunter Island is available. Keep checking back! Create Your Dream Island is going strong! Wow! The Create Your Dream Island contest has only been open for a couple of weeks, and already the entries are rolling in! This picture shows just a sample of the contest entries we've received so far. Is one of them going to be the winner? If you haven't sent your entry in yet, what are you waiting for? 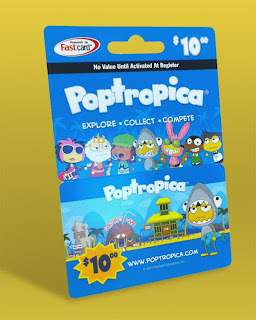 You can get your free entry form at www.penguin.com/poptropica, or in your copy of the Island Creator Kit. We can't wait to see your ideas! Download your copy of Virus Hunter: Pandemic Panic! You read it in serialized form, but maybe you'd prefer to download the complete edition. You're in luck. The Virus Hunter Island prequel story, "Pandemic Panic," is now available as a free printable PDF! And keep an eye out for more announcements about Virus Hunter Island. ...or is it the beginning? ...and could there be a cheesier way to wrap up a prequel story than by asking if it's the end or the beginning? These questions and more will be answered on Virus Hunter Island, coming soon to Poptropica! LEGO CUUSOO -- We reached 10,000! It's been a long road, but at last we've done it. We've reached 10,000 supporters for our LEGO CUUSOO project! Now, it's up to our friends at LEGO to review the project and decide it's something they want to move ahead with. We hope they do. If not, we still had a great time working on "Dr. Hare's Lair," and we enjoyed being able to share it with you. Of course, we've got one more item to give away to thank everyone for their support. The Dr. Hare Light and Shadow Outfits are available now, absolutely free! All you need to do is log into your Poptropica account and enter the promo code DRHARE10000. That about wraps it up! Thanks again for all your help. And keep an eye out for more exciting Poptropica announcements! Surely there's nothing to be afraid of... right? 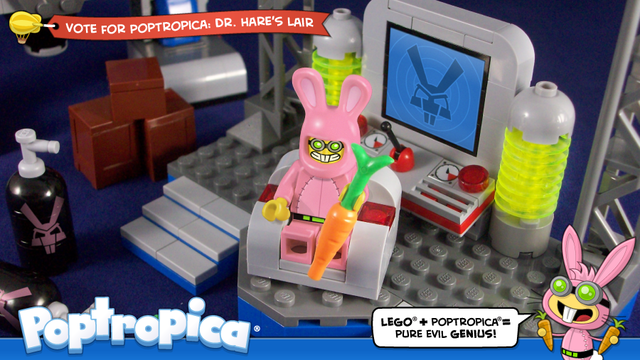 We are so close -- so very, very close -- to reaching our goal of 10,000 supporters for "Dr. Hare's Lair" on LEGO CUUSOO. That's the point at which our job will be done, and our friends at LEGO will decide whether or not to turn this project into a reality. Until then, it's all in our hands. So let's finish strong. Let's cast our support for this project, and bug -- er, urge -- our friends and family to do the same. Since the project launched last winter, we've given away some cool prizes, and we've got another one waiting in the wings for when we reach the goal. Once we reach 10,000, we'll be releasing a code for the new Dr. Hare Light and Shadow outfits! This will be free and available to everyone, but only once we reach our goal. One more time: let's help "Dr. Hare's Lair" get 10,000 supporters! Poptropica Game Cards are now available in Australia and New Zealand! A lot of our North American fans know the benefits of a Poptropica Game Card. It lets you get a Membership without needing a credit card or signing up for a recurring charge. But for our fans in Australia and New Zealand, getting a Poptropica Game Card has been nothing more than a dream. That's about to change. Poptropica Game Cards are now available in Australia and New Zealand exclusively at EB Games! For only ten bucks you'll get a month-long Membership and can enjoy all the benefits: Early Access to new Islands, unlimited use of all costumes and Gold Cards in the Poptropica Store, 30 outfits in your costume closet, all the photos in your photo album, and the special satisfaction of knowing you're part of the inner circle. So, our Australian and Kiwi friends, enjoy! And if you've already got a game card, redeem it here. Do you have what it takes to be a Virus Hunter Island World Champion? With Virus Hunter Island bearing down on us like a freight train, it's time to introduce another great new feature we're adding to Poptropica: a live player map! In the past, Poptropicans have loved our lists of the first 10 players to finish an Island. But 10 is such a small number. Since we're making everything else on Poptropica so much bigger and better, then why not this? That's why the new player map will showcase the Virus Hunter Island World Champions -- anyone who plays and completes Virus Hunter Island during Early Access! You'll be able to see not just the top 10 finishers, but the top 100 and the top 1000. You'll be able to see where you rank. And you'll also be able to see where people around the world are playing Virus Hunter Island. For more on Virus Hunter Island, check out the Virus Hunter Island info page -- and keep an eye on this blog to find out when you can expect Virus Hunter Island to be released! Now that the Create Your Dream Island contest is open, we're excited to start reading your Island ideas. You might be wondering how to get the inside track on a winning entry. You'll find a lot of helpful tips in your copy of the Island Creator Kit. It might sound simple, but one of the very best ways to get our attention is to set your Island in a place we've never done before. Sometimes that's all it takes for us to get excited about an idea. Even if you have a great story, if it's set in Old Japan or on the moon, we'd probably pass. But if it's somewhere new, we'll be interested. Look for something that's never been done on Poptropica! Another way to catch our attention is to look into the distant past, or the far future. For instance, when we were writing Mystery Train, we started with the idea of a mystery story set on a moving train, but it wasn't until we decided to place it in a historical moment -- the 1893 World's Fair -- that the whole thing came together. The when of your story may be as important as the where. We like genre stories. That's why we often start with time-honored premises: a Wild West story, or a vampire story. But try to figure out what makes your idea different. For instance, Astro-Knights Island mashed up two familiar genres -- knights and aliens -- to make something new and original. Believe us, we'd love to make an Island in which Harry Potter and Katniss Everdeen team up to fight Darth Vader. But it's not up to us. Other people own those properties. For this contest, we can't use existing characters, stories, or fictional worlds -- period. So make sure that everything in your entry is an original idea! We can't wait to see what you come up with. You can download an official entry form from our friends at www.penguin.com/poptropica, or get one in your copy of the Island Creator Kit -- available now! LAST DAY TO FIND THE MYSTERY PRIZE! Go find it before it is gone tomorrow! Hint: Look for kids riding bikes.